The Beauty Garden Calendula Organic Hand Care intensively nourishes, protects and moisturizes your hands. Rich in organic calendula with soothing properties, it intensely repairs your hands and prevents skin dryness. Its light texture quickly penetrates the epidermis and provides a feeling of immediate comfort. Your hands are soft and perfectly hydrated! Convenient thanks to its tube format, you can take it everywhere with you! Hydration and repair are the watchwords of this Beauty Garden Calendula Organic Hand Care! Apply this care to the light texture on your hands to the tips of your nails while massaging to activate the blood circulation. You can apply it as often as needed, as soon as you feel the need. Do you prefer creamier textures? 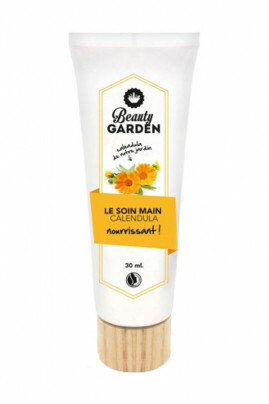 Then prefer Organic Vegan Beauty Garden Cream in its pretty wooden pot!